Caritas Jordan, Roman Catholic Diocese sign partnership agreements. 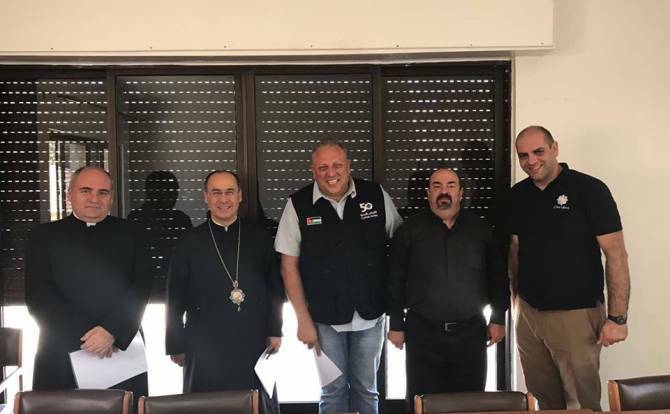 Caritas Jordan and the Roman Catholic Diocese signed partnership agreements on Tuesday, August 1, regarding Pope Francis Center at the Roman Catholic Church in Jabal Weibdeh and the Garden of Mercy at the Roman Catholic Church in Madaba. The agreements were signed by Roman Catholic Bishop Elia Haddad and Caritas Director Mr. Wael Suleiman in the presence of Counselor at the Apostolic Nunciature in Amman Monsignor Roberto Kuna as well as Fr. Nabil Haddad and Fr. Mu’in Hilou, among others. After the signing ceremony, discussions focused on the future projects and the prospects of cooperation and strategic coordination between the Roman Catholic Diocese and Caritas Jordan.